Phil Farrand is a nitpicker extraordinaire. He’s been lucky enough to turn this trait into a talent. As the Chief Nitpicker of the Nitpicker’s Guild, he has found kindred spirits who, like him, enjoy finding mistakes in Star Trek and The X-Files. This has led to four books on nitpicking Star Trek, from Classic era through Next Generation and Deep Space Nine, and this thoroughly enjoyable volume on the first four seasons of The X-Files. Ever wonder what that episode was titled, the one when Mulder undergoes past-life regression hypnotherapy? This can be really frustrating, as The X-Files broadcasts rarely showed any episode title. But in The Nitpicker’s Guide for X-Philes, Ferrand offers not only a summary of each episode’s events, which should allow the reader to recognize any episode in the guide, he also includes an index of Onscreen Locations for those fans who pay rapt attention to the location names displayed at the beginning of some scenes. Ever wonder whether you’re remembering the correct order in which some episodes occurred? Well, if you recall the order in which they were broadcast, you may be right – but not always. Ferrand has taken the trouble to track down every possible clue for the intended date on which an episode was supposed to occur, which is not always after the previously broadcast episode. Ever wonder just how many times Scully is attacked in the bathroom? Or how many times animals fall from the sky? There are enough trivia questions here that a fan of the show will never again get bored during a commercial break. Farrand offers several lists that give insight into how he organizes the episodes. Actions as small as eating a sunflower seed (which Mulder does eighteen times in the first four seasons) are counted, but with little analysis for what this means in terms of character development. Ultimately, this book is a great read for nitpickers who notice every continuity error or wonder just how a 5’3" woman can haul her 6" partner around after shooting him through the shoulder. For those fans who wonder just when Mulder began to trust Scully, or how to recognize whether Skinner is their enemy or ally, this book offers only minimal discussion of motivation and emotions. It is, unfortunately, much harder to quantify elements of character than it is to count gunshots. The technical observations made by Farrand are worthy and witty, and he shows a wry understanding of the developing relationships among the characters. But this is a show in which episodes can be identified as first season, second and third, or fourth season by viewers who pay attention to whether Mulder and Scully are carrying guns, or guns and flashlights, or both and also rubber gloves & evidence bags at all times when either is not standing in a shower. And it saddens me to report that where Scully gets her terrific shoes — the one piece of behind-the-scenes information which I have always coveted — is not revealed. 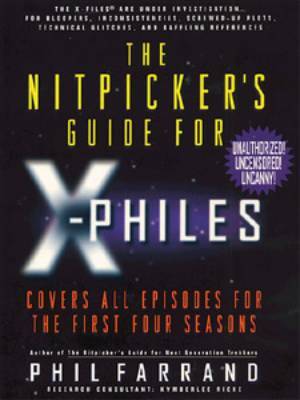 So, if you’re looking for a present for someone who keeps videos or DVDs of the show, The Nitpicker’s Guide for X-Philes is a terrific idea. It’s also good for a reference for the first four seasons. But for long, in-depth discussions of what the writers intended viewers to understand, there’s no substitute for a couple of friends talking while the paused TV image flickers. Originally published in Neo-opsis Isssue 1.